Upper Deck's 2010-11 SP Authentic Hockey features a Future Watch checklist highlighted by the likes of Taylor Hall, Jordan Eberle, P.K. Subban, Jeff Skinner and a host of the hobby's hottest 2010-11 hockey rookies. 2010-11 SP Authentic delivers 3-4 autographs per hobby box. At least 1-2 Future Watch rookie autos per box! Look for autographed Future Watch patch parallels numbered to 100! Future Watch checklist highlights include a who's who of 2010-11 NHL Rookies including Taylor Hall, Jordan Eberle, Jeff Skinner, Sergei Bobrovsky, Magnus Paajarvi, P.K. Subban, Nazem Kadri, Tyler Seguin, Brayden Schenn, Derek Stepan and more! High quality insert autographs: Sign of the Time, Prestigous Pairings, Immortal Inks, SP Chirography, Marks of Distinction and more! 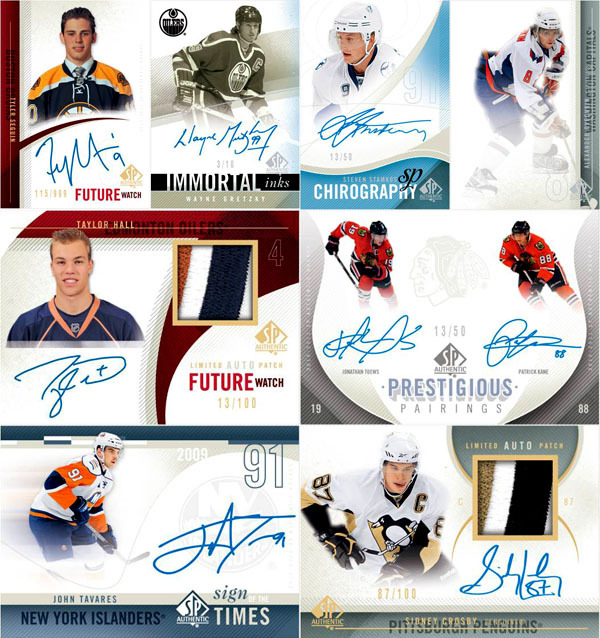 Sign of the Times autographed cards featuring present days legends like Crosby, Ovechkin, Stamkos, Brodeur, Kane and more! Immortal Ink autographed cards featuring legendary names like Gretzky, Lemieux, Orr, Howe, Messier, Esposito, Roy, Yzerman, Neely, Lafluer and more! 1-2 Future Watch patch cards per case! 2010-11 SP Authentic HK HOBBY Box 3 Auto (Tyler Seguin Rookie Patch Gretzky)? WOW – AWESOME PRODUCT! I pulled a Taylor Hall Futures Watch auto out of the two hobby boxes I bought. Also got a bunch of other goodies.